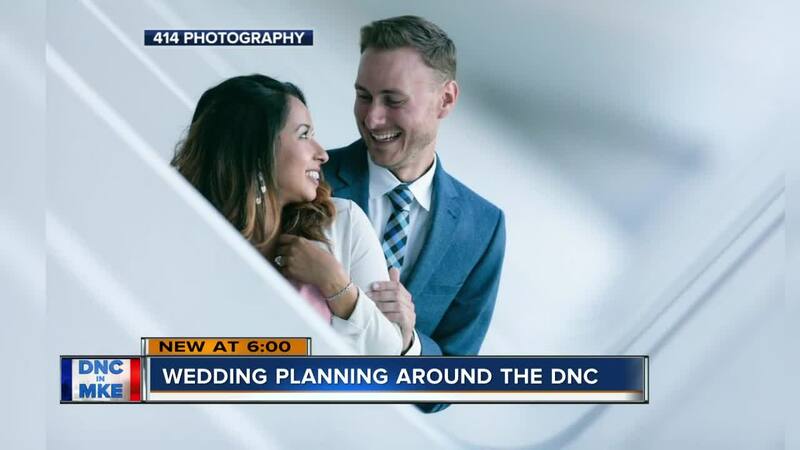 A Milwaukee couple's wedding date is scheduled for two days before the 2020 Democratic National Convention. MILWAUKEE — Soon after a surprise engagement last summer, Erica Mendez and her fiance Matt booked their wedding venue. Their big day was set for July 11, 2020. "We wanted a summer wedding so July was perfect," said Mendez. Then Milwaukee landed next summer's Democratic National Convention. Mendez said it was exciting news for the city they love, but then she realized the DNC starts two days after their wedding date. "Immediately I'm thinking of hotels, airfare, how is that going to affect us," she said. Kristin Wroblewski, owner of the wedding and event planning company Timeless Events, says there is no need to panic just yet. However, if you have a big event in Milwaukee during the DNC you need to get to work and be flexible. "Especially with such a large event coming to town, now is the time to book all your vendors," said Wroblewski. "If you have your heart set on lakefront photos maybe do that for your engagement photos, and do something else for her wedding day photos." While the preparations for a wedding may start sooner than usual, Wroblewski said it can be done. "Milwaukee has done it before with Harley's anniversary so the city can handle it," she said. "We can do it. You just have to be flexible and be aware of what changes that you might have to make." While concerned, Mendez said they are still set on July 11, 2020, but they'll keep their options open. "Maybe that one year mark we'll see how we're feeling if it's something that we need to change or not, but just trying to go with the motions and still enjoy the idea of planning our wedding that we're so excited for," she said. Since we interviewed Mendez, she said her venue advised them to book their hotel rooms and rehearsal dinner as soon as possible.